This briefing provides an overview of the immunity of international organisations and looks at the legal arguments challenging IFC’s immunity in Jam v. International Finance Corporation, a lawsuit brought against the IFC regarding the negative impacts of the Tata Mundra coal power plant in India which could have far-reaching implications in this field. When the fish catch dwindled and the fresh water became salty, when the crops were covered by black dust and respiratory problems started rising, fishing communities and farmers living near the controversial Tata Mundra coal-fired power plant in Gujarat, India, decided to do something. In April 2015, they sued the International Finance Corporation (IFC), the World Bank’s private sector lending arm, in US federal court over the destruction of their livelihoods, lands, and water and threats to their health caused by the IFC-funded plant. The lawsuit, Jam v. International Finance Corporation, brought by EarthRights International on behalf of the communities, will likely require the court to determine whether, and under what circumstances, the IFC can be sued. 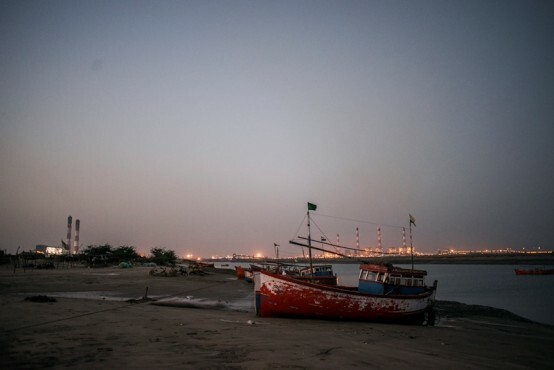 From the outset, the IFC understood the risks that the Tata Mundra project posed to local communities and their environment. The IFC itself classified Tata Mundra as an environmental and social “category A” project, indicating that it could have “significant” adverse impacts that “are diverse, irreversible or unprecedented.” Despite these concerns, the IFC provided a critical $450 million loan in 2008, enabling the project’s construction and giving the IFC immense influence over project design and implementation. In 2013, following a 2011 complaint by the Machimar Adhikar Sangharsh Sangathan (the Association for the Struggle for Fisherworkers’ Rights), the Compliance Advisor Ombudsman (CAO), the IFC’s accountability mechanism, issued a scathing report, finding that the IFC had failed to ensure the project met the IFC’s environmental and social performance standards. The IFC responded to the CAO’s report by rejecting most of its findings and ignoring its recommendations. In its 2015 monitoring report, the CAO found that the IFC had failed to effectively respond to any of the CAO’s findings, and although the audit remains open for monitoring, the IFC has continued to ignore the CAO’s calls for remedial action. With no other avenue for relief, the communities filed suit in federal court in Washington DC, where the IFC is headquartered. The lawsuit alleges that the IFC provided critical funding for the project despite knowing the risks, and failed to take reasonable steps to prevent harm to the communities and to ensure that the project abided by the required environmental and social conditions for IFC involvement. The communities are seeking compensation for harm to their property and economic livelihoods and an order requiring the IFC to enforce the provisions of the loan agreement that were intended to protect local communities and the environment to minimise future harm to the environment. The IFC responded to the complaint in July, asking the court to dismiss the case, arguing among other things that it is entitled to “absolute immunity” – that it is simply not subject to the authority of US courts, no matter how harmful or illegal its actions may have been. The case has raised two major immunity questions. First, is the IFC entitled to “absolute immunity” or instead to the same “restrictive” immunity that currently applies to foreign governments (known as “foreign sovereign immunity”)? Second, even if the IFC is ordinarily deemed “absolutely immune,” has it nonetheless waived immunity to this suit in its Articles of Agreement? The IFC’s immunity is governed by the International Organizations Immunities Act (IOIA). The US enacted the IOIA in 1945, early in the development of the modern international system. The Act states that organisations like the IFC “shall enjoy the same immunity from suit” as “is enjoyed by foreign governments,” unless immunity is waived. This begs the question of whether the IFC gets the immunity that foreign states got in 1945, when the IOIA was enacted, or whether the IFC gets the same immunity that foreign states get today. Either way it should not matter, because the IFC’s immunity argument fails in both cases. In 1945, courts determined whether a foreign state was immune by deferring to the judgment of the political branches, either based on a specific “suggestion of immunity” made by the Department of State (DOS), or, where DOS was silent, by determining whether executive or legislative policy required immunity. Today, the rules and exceptions that govern foreign states’ immunity are laid out in the Foreign Sovereign Immunities Act (FSIA), a statute enacted by Congress in 1976. The IFC’s “absolute immunity” argument relies on a 1998 case, Atkinson v. Inter-American Development Bank, in which the US Court of Appeals for the DC Circuit decided that the IOIA was still stuck in 1945, reading it to mean the same immunity foreign states used to receive. The court also suggested that foreign states at that time enjoyed “absolute” immunity. More recent Supreme Court authority shows that both of these conclusions are incorrect. Since Atkinson was decided, the US Supreme Court has repeatedly held that, in 1945, foreign states were not absolutely immune. As already noted, foreign states received immunity only where DOS suggested it, or, if DOS was silent, where executive or legislative policy required it. In 1952, DOS formally adopted the “restrictive theory” of sovereign immunity, under which immunity shields only a foreign nation’s public acts, not its commercial acts. Congress codified that approach in the 1976 Foreign Sovereign Immunities Act (FSIA). So even if the IFC’s immunity is determined by 1945 standards, the IFC should not be immune here, because US policy allows suits against foreign governments for their commercial activities – like financing a power plant. That assumes courts should look to the rules existing in 1945. 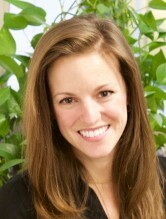 Scholars, however, have criticised Atkinson, and in 2010 another federal appeals court came to a different conclusion. In OSS Nokalva v. European Space Agency, the US Court of Appeals for the Third Circuit held that international organisation immunity is determined by current foreign sovereign immunity law – the FSIA. Most importantly, the Supreme Court has also ruled that immunity is generally determined by the rules in force when the lawsuit is filed. That understanding of the nature of immunity applies equally to the IOIA. Under this interpretation, suits based on “commercial activity” in the US can proceed against international organisations. That should include Jam v. IFC. Even if the IFC is generally entitled to immunity, it could still waive that immunity, allowing the Indian communities’ lawsuit. Courts have recognised that the IFC’s founding document, the Articles of Agreement, contains language that envisages that the IFC could be sued and thus waives immunity in certain circumstances. This waiver provision states that “actions may be brought against the [IFC] only in a court of competent jurisdiction in the territories of a member in which the corporation has an office,” among other things. By its plain language, this provision would seem to allow suits against the IFC in the US. But the DC Circuit has read a qualifier into the waiver provision that narrows its scope. Although the waiver provision contains no such exceptions, the court created the “corresponding benefits” test for determining whether immunity is waived for different types of cases, largely based on the court’s assumption that an organisation like the IFC would be unwilling to relinquish its immunity without receiving a corresponding benefit. Applying the test, the court considers whether a waiver of immunity to allow this type of lawsuit, by this type of plaintiff would further the organisation’s goals and benefit it over the long term; that is, whether immunity would actually hinder the organisation from carrying out its mission or conducting its activities. The court, not the IFC, makes the determination of whether a lawsuit brings “corresponding benefits” to the organisation. Courts have generally ruled that immunity is not waived for suits over an organisation’s internal affairs, such as employment disputes, but is waived for external activities. Like any other corporation, the IFC needs to be able to deal with external parties, even for basic things like telephone service and office supplies. The DC Circuit reasoned that, in such cases, immunity could hinder the organisation’s functions because parties would not want to do business with an entity that is entirely insulated from the judicial system and thus could simply ignore the law. 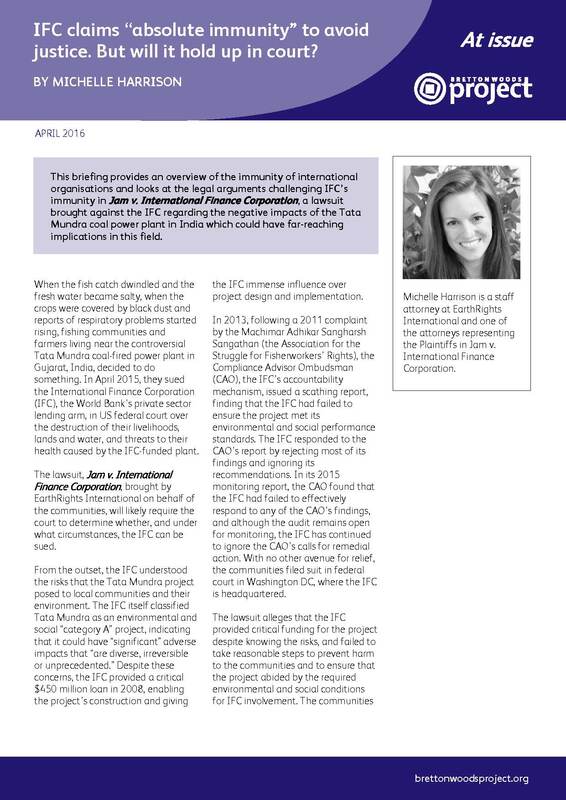 The communities in Jam v. IFC have argued that allowing suits like theirs provides similar benefits to the IFC and helps the IFC fulfill its mission. Their lawsuit arises out of the IFC’s external activities and relationships with host communities, and those relationships are essential to the IFC’s ability to conduct its mission. For Category A projects like Tata Mundra, the IFC requires that a project have “broad community support” before it goes forward. But just as companies providing office supplies to the IFC may hesitate to trust an entity that cannot be sued, host communities will have little reason to believe that the IFC will uphold its promises to ensure that projects abide by the IFC’s environmental and social standards in the absence of legal accountability. 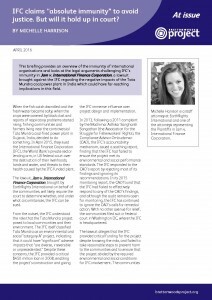 The Jam lawsuit also seeks to directly vindicate the IFC’s core mission. The IFC’s chartered purpose is to “further economic development” and its goals are to end extreme poverty and to carry out its investment activities “with the intent to ‘do no harm’ to people and the environment.” In order to meet these goals, IFC borrowers are required to take precautions to protect vulnerable communities and the environment, an obligation that the IFC is tasked with supervising, monitoring and enforcing. Environmental and social issues are, according to the IFC’s own documents, among “the most critical components of the [IFC’s] mission.” The IFC failed to uphold its own environmental and social standards with Tata Mundra. The IFC’s goals of reducing poverty while avoiding harm are best met by allowing redress for those who have been harmed by the project. The IFC, however, has told the court that allowing the Jam suit would provide no benefit to the IFC, and that the IFC is “perfectly capable” of pursuing its objectives without “interference” by the communities that host its projects. It even claimed that its commitments to environmental and social protections and reducing poverty “are not essential to IFC’s chartered objectives,” contrary to its own public statements. CAO or India as alternatives? The IFC also argued that the Indian communities do not need access to the courts “because the CAO process already provides Plaintiffs with an alternative means of recourse.” But these communities did use the CAO process – in fact, the CAO itself confirmed most of their complaints – and yet the IFC ignored those findings. In its monitoring report, the CAO found that the IFC had failed to effectively respond to any of the CAO’s findings of non-compliance and emphasised the need for the IFC to take a “remedial approach” to addressing project impact. The experience of other communities around the world confirms that host communities cannot rely on the CAO to provide meaningful remedies. Experts from different organisations submitted declarations to the court in Jam, which described their experiences working with communities going through the CAO process and the inadequacies of the CAO. For example, one expert from the NGO Accountability Counsel explained that the CAO process had failed to produce any results for indigenous communities in Peru affected by an IFC project. She concluded that “without accountability . . . the IFC not only failed to alleviate poverty, but caused the communities increased marginalisation and ongoing suffering.” Other experts offered similar testimony about the failures of the CAO process regarding projects in Kazakhstan and Honduras. Most of the experts emphasised the institutional limitations of the CAO. The CAO itself expressly states that it is not a “legal enforcement mechanism” nor “a substitute for international court systems or court systems in host countries.” The Tata Mundra case confirms that even when the CAO sides with project-affected communities, the CAO cannot provide a remedy. Unlike a court, the CAO is without any power to enforce its findings if the IFC decides it does not want to address the CAO’s concerns. In an effort to convince the Court to dismiss this case and instead have it heard in India, the IFC makes perhaps its strangest argument; that while it maintains absolute immunity in US courts, without waiver, it can be sued in India. What makes the IFC’s argument so bizarre is that it is based on exactly the same waiver provision that the IFC argues does not permit it to be sued in the US. In conclusion, the IFC has asked the court to recognise that it is absolutely immune from judicial process and that victims may only complain to the CAO, a mechanism which the IFC can, and in this case did, choose to ignore. Such hubris is at odds with the IFC’s mission, and recognising the impunity and special treatment the IFC requests would do it no favors. Only the threat of judicial enforcement can ensure the IFC takes its obligations seriously. On 24 March, the district court ruled that the IFC has immunity from suit in US courts and dismissed the case. The court concluded that it was required to find that the IFC is entitled “absolute immunity” based on previous decision from the DC Circuit. The court did not consider the plaintiffs’ argument that recent Supreme Court cases overturned the DC Circuit decisions, but held instead that it should be heard and decided by the DC Circuit on appeal. As to the question of waiver, the court ultimately determined that the IFC had not waived immunity in this case, noting that prior court decision have thus far only found immunity to be waived where the plaintiff has a commercial relationship with the IFC. The court recognised in its decision that “the CAO cannot compel the IFC to right its wrongs, or to provide remedies to individuals who have been harmed by IFC-financed projects.” If the IFC is not subject to the authority of the courts, there will be no one who can compel the IFC to do so. The plaintiffs intend to appeal, thus the immunity questions will ultimately be decided by the DC Circuit on appeal. Republic of Argentina v. NML Capital, Ltd., 134 S.Ct 2250, 2255 (2014); Samantar v. Yousuf, 560 U.S. 305, 311 (2010); Republic of Austria v. Altmann, 541 U.S. 677, 689 (2004). 617 F.3d 756 (3d Cir. 2010). Altmann, 541 U.S. at 696; Dole Food Co. v. Patrickson, 538 U.S. 468, 478 (2003). Vila v. Inter-Am. Investor Corp., 570 F.3d 274, 279 (D.C. Cir. 2009).